Momentum is committed to making our fresh, easy-to-store, vacuum-sealed pouches available to you in stores across the United States. We use 100% pure and human grade ingredients in all of our products. All meat product is sourced in America and passed through USDA inspected plants. 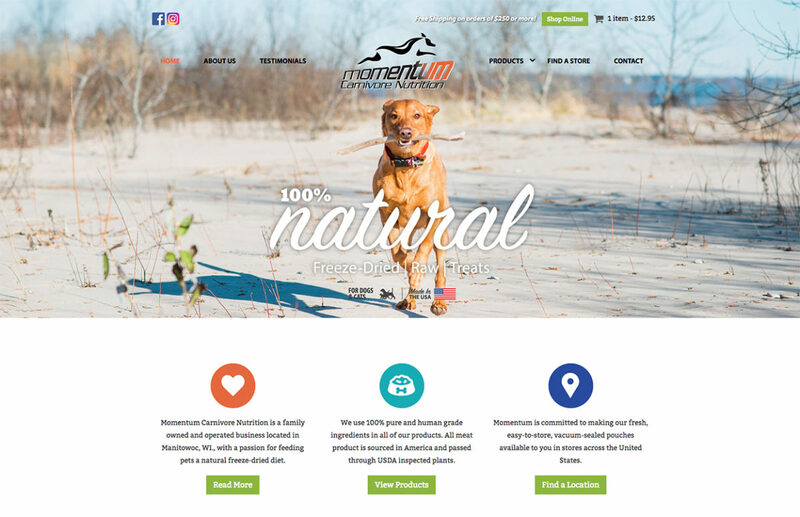 Momentum Carnivore Nutrition is a family owned and operated business located in Manitowoc, WI., with a passion for feeding pets a natural freeze-dried diet. We began to pursue a raw freeze-dried diet to improve the health of our pets. What we learned was the basis of Momentum Carnivore Nutrition. Dogs and cats are natural carnivores and raw diets have all the inherent nutrients such as: amino acids, fatty acids, vitamins, minerals, enzymes and phytochemicals upon which the dog evolved. Our pets began a raw freeze-dried diet and within weeks their joint and bone health improved. They recaptured the vitality of years past. Most importantly, they were able to do what they loved most…bird hunting. From that point forward, we have made it our goal to enrich the lives of as many beloved pets as possible.